When it comes to writing a stellar college application essay, my advice is fairly succinct: Be yourself. I know there are lots of articles that tell you to watch your grammar and punctuation, to use correct capitalization, to stay on-topic - and those are all great pieces of advice. But I’m going to assume you know all that because it’s common sense. I’m going to hope you realize that when it comes to the writing portion of a college application, you know you need to turn in your best work. You know that spellcheck can betray you, that your extensive “tutoring” may turn into “torturing” because you relied solely on software to handle the copy editing. But what you might not know is that the hardest part isn’t necessarily the mechanics. The hardest part can be making sure that your essay is authentic, that it really sounds like you – not your mother, your advisor, or your Uncle Bob, who wears Maize and Blue every Saturday and has taken you to every home football game since you were 10. Don’t get me wrong - school spirit is wonderful. So is editing. But this is your application, after all, and we want to know about you. We want to know what makes you stand out from the crowd – what makes you a good fit for the University of Michigan. We don’t want a list of awards and achievements; we’ll have those on your application. We want a written snapshot of who you are – right now – and how you got that way. 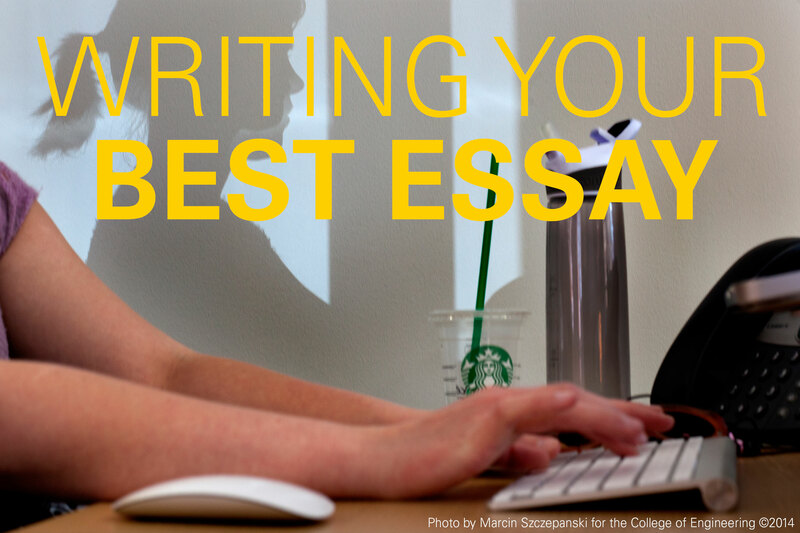 When you see the essay portion on your application, you’ll have several choices, or prompts. One will let you tell your story in the best way possible. Choose it. Play to your strengths. Your college essay will be one of nearly 50,000 that we’ll be reading in admissions – use this opportunity to your advantage. Your essay gives us insights into your personality; it helps us determine if your relationship with the school will be mutually beneficial. So tell us what faculty you’d like to work with, or what research you’re interested in. Tell us why you’re a leader – or how you overcame adversity in your life. Tell us why this is the school for you. Tell us your story. And be yourself. Really – it’s some of the best advice I can give.